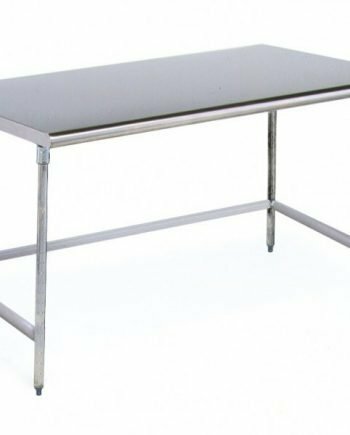 Heavy duty 14 gauge type 304 all stainless steel construction solid top cleanroom tables. Electro-polished solid-top stainless steel tables provide ultra-clean, smooth, and easy-to-clean work surface ideal for cleanrooms. They can be ordered with an H-Frame or C-Frame base. Perforated top and custom size is also available. Shipped Alcohol-wiped and cleanroom bagged all knocked down to reduce freight costs and potential for freight damage. Click on the product codes to see the datasheet or request a quote or use the filter at the left menu to find your glove box quickly. Cleanroom Table 36″ x 72″ Solid Top Electropolished Stainless S.
Cleanroom Table 36″ x 60″ Solid Top Electropolished Stainless S.
Cleanroom Table 36″ x 48″ Solid Top Electropolished Stainless S.
Cleanroom Table 36″ x 36″ Solid Top Electropolished Stainless S.
Cleanroom Table 30″ x 96″ Solid Top Electropolished Stainless S.
Cleanroom Table 30″ x 84″ Solid Top Electropolished Stainless S.
Cleanroom Table 30″ x 72″ Solid Top Electropolished Stainless S.
Cleanroom Table 30″ x 60″ Solid Top Electropolished Stainless S.
Cleanroom Table 30″ x 48″ Solid Top Electropolished Stainless S.
Cleanroom Table 30″ x 36″ Solid Top Electropolished Stainless S.
Cleanroom Table 24″ x 96″ Solid Top Electropolished Stainless S.
Cleanroom Table 24″ x 84″ Solid Top Electropolished Stainless S.
Cleanroom Table 24″ x 72″ Solid Top Electropolished Stainless S.
Cleanroom Table 24″ x 60″ Solid Top Electropolished Stainless S.
Cleanroom Table 24″ x 48″ Solid Top Electropolished Stainless S.
Cleanroom Table 24″ x 36″ Solid Top Electropolished Stainless S.